We are obsessed with lying, a subject which has been much in the news recently. A main concern has been the production of ‘fake news’, news that is a lie. The issue is of fundamental importance: if we don’t have proper evidence and accurate testimony then we can never get to the truth. Of course, sometimes that is not possible however hard we try, but that does not mean we can abandon conceptions of truth. Without a belief in truth there can be no conception of lying and all behaviour becomes morally relative. This is why there is a widespread belief that lying is such an awful crime, that to be exposed and labelled a liar singles out the perpetrator as scarcely human. It is little wonder that there are so many lists of famous liars easily available on the internet debating whether Richard Nixon is worse than Lance Armstrong, Bill Clinton more pernicious than Jeffrey Archer, or Zeus more culpable than Odysseus. Lying generates easily justifiable anger as it violates a fundamental human contract which demands that we tell the truth when asked. Lying has a history; it is just not one that can be easily recognised or narrated. Debates about lying are venerable, and in many ways they never change. There are two extreme positions. On the one hand there is the argument that one should never lie, most famously articulated by Immanuel Kant, who argued that one had a duty to tell the truth even to the murderer at the door. Then there is the opposite position which argues that we need to face up to the fact that people lie all the time, and, perhaps, even the ability to tell lies is a sign of civilised sophistication. Most of us live in between these positions and simply tilt one way or the other, depending on circumstances. Fleeing his pagan persecutors down the Nile in a boat, the wily Church Father, Saint Athanasius of Alexandria, was asked if he knew where Athanasius was. “I believe he is in the area,” he told his pursuers, who set off to find him as he made good his escape. 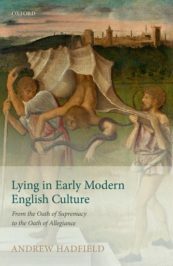 Persecuted Jesuits in Elizabethan England were instructed in these cunning arts, enabling them to avoid lying while not actually telling the truths that the authorities wanted to hear. If asked if they were a priest, they could vehemently deny it, silently adding “Of Zeus”, which God, but not the men eager to execute them, would hear and understand (mental reservation). If a sympathetic householder harbouring a priest was asked if one “lay (lived) in his house” he could exploit the pun and deny it in good faith, because the priest was standing up (equivocation). For the Protestant authorities these were simply lies; for Catholics, smart thinking endorsed by God to preserve the true faith. Lying generates easily justifiable anger as it violates a fundamental human contract which demands that we tell the truth when asked. Crises of authority, when no one is sure who is really in charge and who guarantees truth and reality, place pressure on issues of truth and give rise to anxious debates about whether it is permissible to lie, as well as numerous instances of lying. Probably the greatest and most widespread crisis was the advent of the Reformation five hundred years ago when Martin Luther nailed his Ninety-Five Theses to the Church door in Wittenberg on 31 October 1517, an event which still haunts the world today. With the authority of the church attacked and Protestants arguing that men and women had to communicate directly with God, it is easy to see why issues of truth and lying assumed an even greater importance than they normally did. Catholics taunted their rivals that they had the church to guide them whereas Protestants were on their own. They might tell lies which resulted in eternal damnation. In England, Henry VIII assumed control of the English church after he inaugurated the split with Rome in 1532. One of the first to be tried for denying Henry’s supremacy was Thomas More, executed on 6 July 1535. At his trial More famously accused the main prosecution witness, Richard Rich, of being a liar. Perhaps this is fair, but both More and Rich agreed that he had spoken exactly the same words, denying that the king had the right to declare himself head of the church. More and Rich both agreed that they had had a conversation while More’s books were being removed when he was imprisoned in the Tower for refusing to swear the Oath of Supremacy declaring that Henry VIII was the Head of the English Church. More asked Rich if he would accept parliament’s judgement if the assembled body declared that God was not God. When Rich declared that parliament had no such power, More countered that neither political body had the right to make the king the head of the church. For More this was the sort of hypothesis that any decent common law lawyer would discuss; for the crown, in the febrile and terrifying days after the Reformation, this was treason, words uttered with malice designed to damage the crown. More protested his innocence but was found guilty. Rich was, he asserted, a liar, because he had misrepresented his innocent, truthful words. More was, according to the crown prosecution relying on Rich’s testimony, lying about his motives and meaning. We have the same words, but different ideas about meaning, context, and what constituted a lie. It is hard to see that we will sort out the problem of truth and lying in the near future. Mary McCarthy’s famous accusation that everything that Lillian Hellman said was a lie including ‘and’ and ‘the’ is a recognition that lying is an endemic problem as well as a vicious attack on someone she despised. Narrating the history of lying will never provide satisfying, certain answers. Instead, we should explore particular historical moments and discover what happens to truth and lies in times of crisis. Featured image credit: Renaissance schallaburgfigures by bogitw. Public Domain via Pixabay. Andrew Hadfield is Professor of English at the University of Sussex and visiting professor at the University of Granada. He is the author of a number of studies of early modern literature and culture including Edmund Spenser: A Life (2012), which was awarded the Elizabeth Dietz Memorial Award, The Oxford Handbook of English Prose 1500-1640, Shakespeare and Republicanism (2005), which was awarded the Roland H. Bainton Prize for Literature, and Lying in Early Modern English Culture (2017). He is currently co-editing the Complete Works of Thomas Nashe and is chair of the Society for Renaissance Studies. primary remedy to a breach. Lying does not directly cause damages, especially grave damages. in any ill effect from a lie. Lying is so common in human society. Everyone has done it at some point in their life whether it was to benefit themselves or to save others from potential harm. The question of whether lying is ethically and morally wrong is a tough one. There are so many situations that you would have to consider before labeling a lie as unethical or ethical. I think that If a murderer asked if you are the only one in the house and you tell him yes knowing that your kids are also in the house then that is a situation where lying is okay because you are protecting the well being of your children. The real question is how do we draw the line of when lying is okay and when it is wrong. This is the hardest thing to do because everyone is going to have different morals and different ideas. How do we spread truthfulness rather than lying? How can we know when lying is okay and when it is not? Ethics in Human Communication. Sixth Ed.